Abubakar Mumuni, the defensive midfielder of New Edubiase United FC, has arguably been one of the most talked about players in the GLO Premier League 2010-2011 during the last couple of days. On 02.07.2011, Mumuni was rather sensationally adjudged the “2010-2011 Premiership Player of the Year” according to the Sports Writers Association of Ghana (SWAG). This is a very prestigous award by Ghanaian standards. The other two nominees were Emmanuel Clottey of Berekum Chelsea FC and Ahmed Touré of Asante Kotoko FC, both prolific strikers who have received a lot of media attention during the season. Mumuni is more of a quiet worker who rarely gets headlines and therefore a few eyebrows were raised. Obviously, this is also related to the fact that the club of Mumuni, New Edubiase United FC, is quite unfashonable. The club was tipped for relegation before the season but ended as number seven in the GLO Premier League 2010-2011, which has to be categorized as a great achievement for a club with limited resources. In any case, it is a fact that Mumuni is one of the most promising midfielders in the GLO Premier League. Apparently, Mumuni started playing football for a club called “Tema Hearts Babies FC”. This is an amateur club from Tema, a city on the Atlantic coast of Ghana. However, my first record of Mumuni is from the GLO Premier League 2009-2010. I know that Mumuni was an important member of the team and I can document that he scored at least one league goal during the season. It is fair to say that the GLO Premier League 2010-2011 was the breakthrough for Mumuni. He received the captain’s armband during the early stages of the season and as far as I know, Mumuni should be considered as the captain of New Edubiase United FC. Mumuni scored one league goal during the season, against King Faisal Babes FC on 19.09.2010. Through contacts I have access to the official player registrations before the GLO Premier League 2009-2010 and according to this document, Mumuni is born 17.05.1993. Personally, I think this is correct and it is a fact that Mumuni was included in the squad of the Ghana U-17 national football team in January 2011. In other words, Mumuni turned 18 a couple of months ago. It is quite remarkable that a 18 year old player captains a top division side in Ghana and I know that there has been reactions as Mumuni was not included in the squad of the Ghana U-20 national football team for the Orange African Youth Championship that was played in South Africa earlier this season. I have personally seen Mumuni twice. He shined on both occations and it was easy to see that he is one of the key players at New Edubiase United FC. He seems to prefer playing as a central midfielder / defensive midfielder but I know that he has also played some matches in defence. Mumuni is basically the “engine room” of New Edubiase United FC. His tackles are great and he directs the distrubution of the ball towards the flanks or further up front. From time to time, he seemed more like a deep-lying playmaker. As far as I could tell, Mumuni is quite strongly built and he has a great physical presence. As far as I know, there has so far not been transfer speculations regarding this highly promising player. It will most likely only be a matter of time before top clubs notices this wonderboy. 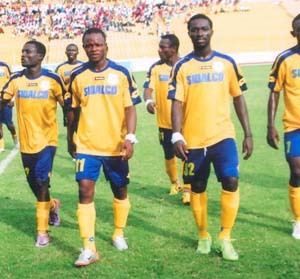 The picture shows players of New Edubiase United FC. I am not sure if Mumuni is one of the players.